A Position the tank cleaning nozzle(s) at the center of the tank, roughly one-quarter of the distance from top to bottom. B Nozzles invariably leave an unsprayed shadow area directly overhead, the size of which varies according to the type of nozzle and the piping. C The distance between the top of the tank and the nozzle should amount to approximately one quarter of the nozzle’s cleaning radius. Size your unit to ensure sufficient flow to the top part of the tank wall. D The film of liquid grows thicker toward the bottom of the tank, where the washing effect is the most pronounced. E Standing water reduces impact and allows solids to accumulate. Make sure that the drain can handle whatever you put into the tank. F The longest spray distance is from the nozzle to the bottom corner, so the nozzle should be sized for this “effective washing distance”. Tank and Vessel Washing Nozzles represent another highly specialized group of products. Automated tank cleaning increases productivity, ensures safety compliance and can improve product quality. These nozzles are available in 316 SS, Teflon, PVDF and alloys such as Hastelloy C 276. These nozzles also are available with many different spray pattern choices and inlet configurations. One of the first things you need to do to begin the selection process is to determine the radial throw and the type of washing required. 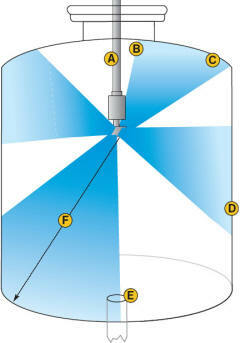 In our latest Spray Nozzle Engineering Manual you'll find a chart that will get you pointed in the right direction. Once you determine the member of our tank washing family that will meet your requirements, you can then specify the flow rate, spray coverage, inlet connection and material of construction. Keeping with the tradition of satisfying your requirements, We will modify their standard nozzle designs, supply them as part of a manifold/lance system and even provide you with the rest of the fluid package (complete with controls), depending upon your requirements. Most of the time a quick call or fax to our office will get you pointed in the right direction. You can also fill out our tank washing questionnaire on-line. We may be able to provide you with samples for non-destructive testing & evaluation. Large tank cleaning machines can be leased for long trials or infrequent applications. Our latest Spray Nozzle Engineering Manual has several pages dedicated to tank and vessel washing nozzles. Our brochure describes most of the nozzles used for CIP systems, plus technical information on nozzle selection and performance. Read an excellent paper describing the pro's and con's of various vessel washing nozzles, which can be viewed by clicking here.